A look at the life of a mother and daughter who live in a low-rent welfare motel surrounding Disney World. 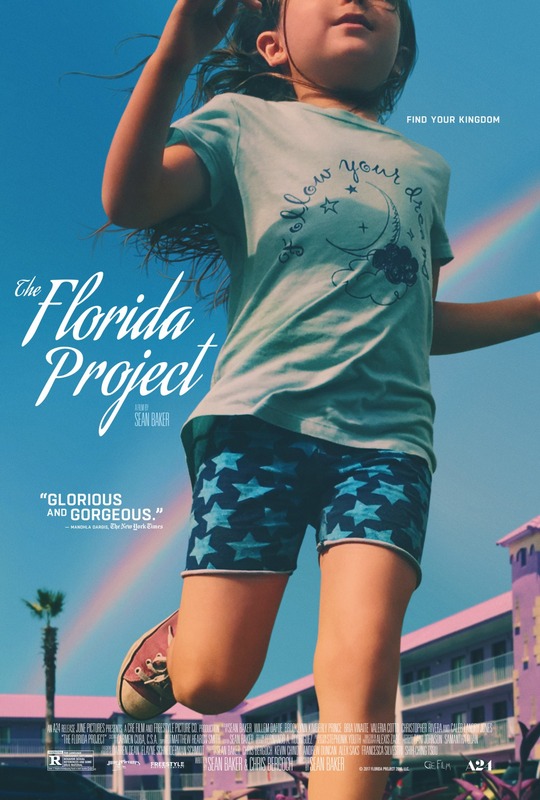 Slice of life dramas are very common among independent filmmakers, and "The Florida Project" is yet another one from A24 studios. Director Sean Baker's film focuses of a little girl named Moonee, played by newcomer Brooklynn Prince, who lives with her mom, played by fellow newcomer Bria Vinaite, in a low-rent motel called The Magic Castle that is painted a whimsical lavender color due to its proximity to Disney World. Moone spends most her time running around with her friend Scooty, played by Christopher Rivera, who also lives in the 'purple motel,' and their new friend Jancey, played by Valeria Cotto, who lives across the way at the Futureland Inn. These kids run about on their own, make mischief, and get into trouble. They are almost always left unsupervised while their parents do what they have to do to get by. Don't go into a movie like "The Florida Project" expecting a film with an in-depth plot or an engaging narrative. This story is about the characters and their situations. It examines what it's like to be a latchkey kid living in sleazy motels who probably shouldn't be out running around on their own. These are youngsters who have parents who pay their rent on a week-by-week basis and often do illegal things to hustle money in an effort to provide as best they can for their kids. What you can expect, however, is a lot of tremendous camera work, some unique blocking, some interesting framing of the camera shots, and a radiant, energetic, lively color palette to juxtapose the harsh realities of the story. The acting is excellent, especially considering most of the people in this film are newcomers. Brooklynn Prince is exceptional in this as she gives a natural performance as a kid simply being a kid while doing youth-aged things and having childlike mannerisms... most of the time. It's obvious she has picked up some bad habits from her mother, who often curses, flips people off, and throws tantrums when she doesn't get her way. Prince gets one extremely emotional moment towards the end of the film which left me in tears and BigJ a little shy of misty. It is a very impactful moment when the weight of a situation comes to a head finally hits her like a ton of bricks. It's really a wonder how director Sean Baker got the children from this movie to act so naturally. Bria Vinaite plays a wonderful dysfunctional mother. She's clearly a hellish parent, but loves and is loyal to her daughter no matter what happens. Willem Dafoe plays the manager at the discount motel where Moonee and her mother reside. He gets to play a multi-layered character who is often stuck between doing what is right for the kids who live in his motel and being forced to do what is right when it comes to his job. He cuts the kids a break and looks out for them where he can, but also has to be stern and has to do his job. The lack of any narrative structure and the film's abrupt ending could definitely turn viewers off. It starts to become a bit repetitive by showing similar situations over and over, though this is done to allow the audience to understand the repetitive nature of the lifestyle. These elements certainly bothered the people in our Monday morning showing who left the theater saying things like, "I'm sorry I took you to this," "THAT'S IT? !," and "that was terrible!" In the end, we enjoyed "The Florida Project." It's effective in the right places, it's raw in the right places, and definitely hits close to home in some scenes (perhaps a little too close to home). Though we aren't in the group proclaiming this to be the best film of the year, it is certainly a captivating, vibrant watch featuring a group of people from a part of society that is almost entirely underrepresented in cinema as they live in the shadow of the magic of Disney World. This movie reminds us of "American Honey," but with much younger protagonists. Unless slice of life character-driven films aren't your thing, you'll probably enjoy this one, too. It's interesting that you saw it on a Monday morning. I bet that made a difference. I saw it on a lazy Sunday afternoon and it felt like a vacation. It was a crowded theater in Hillcrest and every comment I heard was glowing. I went with the Discount Movie meetup and we had a good discussion afterwards. Like I said on Instagram, how we feel about a movie depends on many circumstances.